Here is an original photo of Detroit Red Wings center Dylan Larkin signing autographs at a Red Wings open house, recently held at Joe Louis Arena. The shot is provided by Lance Martinez from My Detroit Sports. Now in his second NHL season, Larkin has posted 9 goals and 2 assists thus far, coming off a rookie campaign that saw the Waterford, Michigan native tally a very impressive 23 goals and 22 assists, in 80 regular season games. Larkin’s first season also included an appearance in the NHL All-Star Game. The Red Wings organization most certainly hopes that Larkin will be one of the cornerstone players during the club’s first several years at Little Caesars Arena, which opens for business next season. 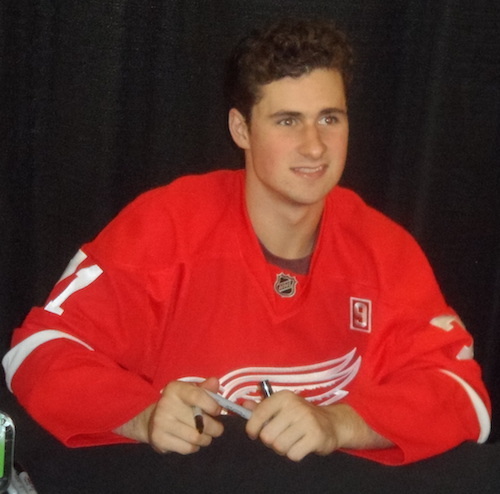 Michigan hockey fans can also check out video of a Dylan Larkin autograph signing, last season in suburban Detroit.